They were Stream Silver (sometimes described as ‘Stream Grey’), Flame Red and Blue Infinity. The blue and silver were also used on Caponords, and a 2008 RSVR even appeared in a very similar (if not the same) blue. A new colour scheme was added for 2002, the two tone Ash Grey – also used for Caponords. After that the Futura had a bit of a makeover for the UK, Europe and Australasia, possibly due to poor sales and in came the RS Touring in two two-tone paint schemes and with a re-modelled seat. 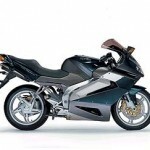 The RS Touring was never imported to the US, and instead US customers continued to get single colour and Ash Grey Futuras until the bike ceased production. And Blue Hilton, which looked more green than blue – see next page. There are plenty of examples of the standard paint in the photo galleries on this site. Futura paint can be difficult to match and is best done by a professional. Aprilia do not release paint codes either. Some colours are easier than others are available as touch-ups on ebay from a company called Bike Colours. Flame Red would appear to be the hardest to match, made harder still by its tendency to fade, especially in strong sunshine. This makes it impossible to get a replacement panel to match exactly and there have been cases of owners refusing new panels because they thought they were the wrong colour. Both Flame Red and Stream Silver are made up of four coats of different colours. 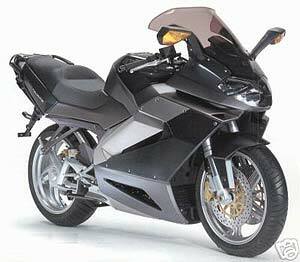 Of course, the Aprilia Futura has been knocking around a few years now and there are plenty of bikes with custom paintjobs. If you’re looking for inspiration you can see a selection in the photo galleries on this website.